Tadoba National Park is no less than an empyrean for wildlife lovers and nature admirers. Spread over 625 square kilometers, Tadoba boasts an extensive population of Royal Bengal Tigers. In addition, this national park also encompasses various exotic wildlife species such as Leopard, Sloth Bear, Gaur, Rusty Spotted Cat, Ratel, Indian Mouse Deer, Wild Pig, Four Horned Antelope, Flying Squirrel, etc. 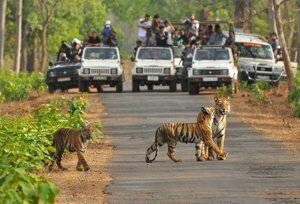 When the tour to Tadoba National Park meets with the tour to Nagzira National Park, the delight becomes twofold. This 04 Nights and 05 Days tour itinerary is formulated in a way to make the wildlife enthusiasts relish the nature's exquisiteness and exotic flora and fauna in a way awfully gratifying. 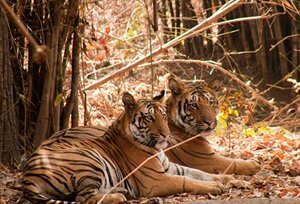 Taking tourists close to deepest secrets of Tadoba and Nagzira woods, this itinerary is best for nature admirers and nature photographers as well. On arrival at Nagpur railway station or airport, our representative will meet and transfer you to Tadoba. 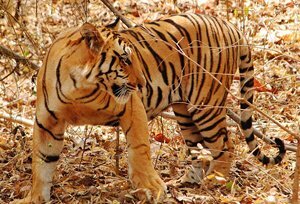 Located in Chandrapur district, Tadoba Andhari Tiger Reserve is the oldest and largest national park in the state Maharashtra. Tadoba National park contains some of the best of forest tracks and endowed with rich biodiversity. It is famous for its natural heritage. Tadoba is an infinite treasure trove of innumerable species of trees and plants - and wildlife that includes Tigers, Panthers, Sloth Bears, Hyenas, Jackals, Wild Dogs, Bison, Barking Deer, Nil Gai, Sambar, and Cheatal. Upon reaching, check into the wildlife resort. Later, fresh-n-up and enjoy a scrumptious lunch. Thereafter, in the evening you are free to take pleasure in a nature walk, followed by dinner and an overnight stay in the resort. Early in the morning the jeep will pick you up from the resort for the jungle safari. It is the best time to sight various birds stretching their wings high in the sky. Besides the birds, various other wild animals will be waiting to greet you. After the jungle safari return to the resort for breakfast. Enjoy the breakfast, then lunch and then again head off for an evening jeep safari into the national park. In the evening you have more chances of sighting tigers. Return to the resort before it gets too dark. Enjoy dinner and an overnight stay at the resort. Known for its rich biodiversity, the Tadoba National Park is nothing less than a paradise for wildlife enthusiasts. Owing to the presence of the big cats, the park was announced as the 41st Tiger Reserve of India. Along with the tigers, the park provides a home to the Wild Boar, Leopard, Spotted Deer, Rusty Spotted Cat, Indian Mouse Deer, Sambar, Gaur, Sloth Beer, Four Horned Antelope, Flying Squirrel and so on. After a sumptuous breakfast we will leave for our next wildlife destination in the state. Morning we will drive to Nagzira National Park, located within the north-eastern corner of the state in Bhandara district. Nagzira National park is often referred to as the Green Oasis of Vidharba due to its beautiful and dense forest. 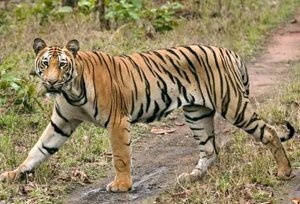 Nagzira national park is home to animals like Tigers, Panthers, Leopards, Bisons, Sloth Bears, Sambar, Four-Headed Antelope, Blue Bull, Chital, Barking Deers, Mouse Deers, Civet Cats, Jackals, Jungle Cats, Spotted Hyena, and Hare. Among the birds that are prominent and commonly seen are Peafowl, the Grey Jungle Fowl and the Red Spur Fowl etc. Upon arrival, check into a wildlife resort. In the evening you are free to enjoy a nature walk in and around the resort, followed by dinner and overnight stay. Early in the morning a jeep will wait to take you on a safari into the Nagzira National Park. Being the home to various animals, Nagzira is the best destination to spot wildlife. Bask in the wilderness of the park and later return back to the resort for breakfast. Before lunch you are free to relax and post lunch you will have to get ready for the evening jeep safari into the park. While the sun descends down, the predators move out in search of their prey. Tigers are nocturnal animals; thus, are more active during the night. Therefore, the evening safari will give you more chances of sighting the striped cats. In addition to the big cats, you can also witness a variety of beautiful birds. Return to the resort before it gets too dark. On reaching the resort, relax and have a cup of tea, followed by dinner and an overnight stay. Cosseted within the picture perfect vista of the mountains, Nagzira is the best place for wildlife lovers. The Nagzira National Park is among the top reserves for sighting the big striped cats, the tigers. You can see these cats playing, jumping and even hunting in the park. Along with the tigers, the park also has various other animals and birds. Get up early in the morning for the final jungle safari to the national park before leaving. After completion of the morning safari return to the resort for fresh-n-up and breakfast. Later leave for Nagpur to connect for the onward travel.